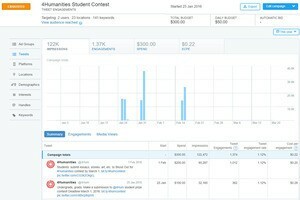 4Humanities.org collected multilingual keywords and Twitter hashtags (jump to list) for paid social-media campaigns on Twitter and Facebook to promote its Shout Out For the Humanities student prize contest in 2016. In the case of Twitter, promoted campaigns place specific tweets in the timelines and also search results of people in nations and demographic sectors selected for the campaign who either follow or search for those particular keywords/hashtags. In the case of Facebook, promoted campaigns place ads in the view of Facebook users similarly targeted by nation, demographic sector, interests, and so on. 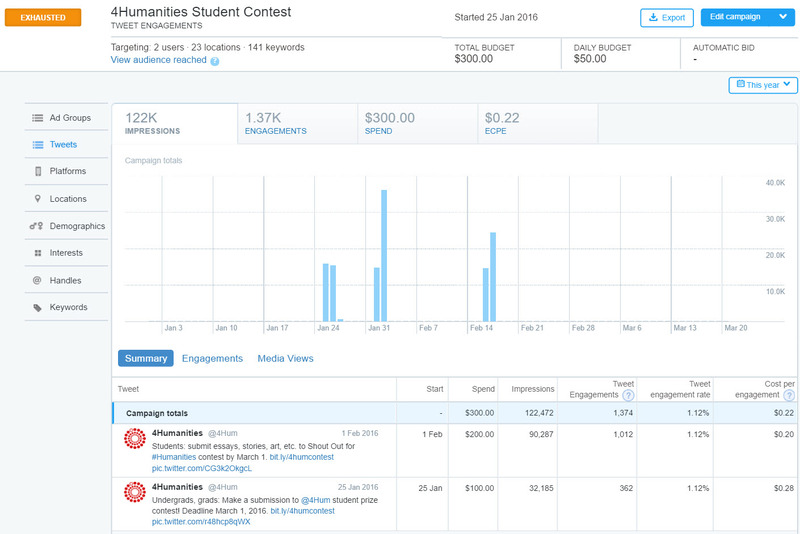 Twitter campaign: 4Humanities configured the Twitter campaign for its “Shout Out For the Humanities” student contest to target 24 nations in the socio-geographical West, East, and South. We set a throttle of $50 USD maximum expenditure for promoted tweets each day up to a maximum total expenditure per promoted tweet of $100 (increasing the total maximum when and as needed for additional tweets designed for repeated bursts of promotion). Fueled by our list of keywords/hashtags, a buy of $50 USD per day resulted in about 50,000 total “impressions” for that expenditure (people seeing the tweet). The “engagement” metric for these impressions was about 200 (people clicking through to the URL in the tweet, retweeting, “liking,” etc.). Other Twitter campaigns targeting different numbers of nations and demographic sectors will have different expenditure rates per day. Note: when conducting a promoted social-media campaign, it is useful to accommodate users’ typical synonyms and typos for words. Twitter promotions automatically suggest including in a campaign variant terms, including typos, related to designated keywords and hashtags. Facebook campaign: 4Humanities configured its Facebook campaign to target a similar number and range of nations as its Twitter campaign. In the case of Facebook, we set a daily throttle of $2 USD per day up to a total maximum of $50 for each burst of promotion (repeating the promotion for two separate ads). (We set a lower daily throttle compared to our Twitter campaign because the cost per-engagement in a Facebook campaign is apparently lower by about one decimal order of magnitude than the same cost per-engagement for a Twitter campaign.) The Facebook posts we promoted reached a total of between about 10,000 and 15,000 people each,and generated respectively between about 2,500 and 10,000 “engagements” (“likes,” “shares,” etc.). Acknowledgements: 4Humanities collected these keywords and hashtags by consulting scholars and others fluent in the relevant languages and in social media. Our special thanks to Rens Bod, Molly Des Jardin, Dominique Jullien, Claudio Fogu, Élika Ortega, and Andrea Römmele.